About 5 minutes into Joko Anwarâ€™s latest film and I was convinced that he was actually God. Another 40 minutes and I had realised that he wasnâ€™t really, but that he is rather an incredibly talented director with an imagination the size of a starship. The fact that Quiet Earth had highly recommended this based on Anwarâ€™s previous film Kala had peaked my interest, but I had no idea what I was getting myself into here. The film opens with Gambirâ€™s latest exhibition, life casts of pregnant women which are causing a stir in the art world and fetching a very good price for the young sculptor. Although his girlfriend, Talyda, is proud of him and his friends appear to be happy for his success, there remains a air of jealousy and rivalry in their conversation which runs throughout the film, and becomes one of the central themes that this picture deals with, along with weakness, masculinity, secrets, pride, infidelity, murder and eventually insanity. Anwarâ€™s film is so layered and mysterious, itâ€™s a compelling and beautiful work. Itâ€™s been a long time since a film has come along thatâ€™s been so playfully weird and yet so skillfully constructed. 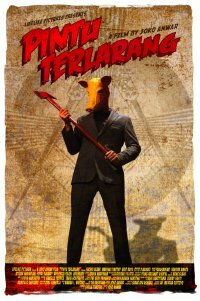 For fans of David Lynch and even Alejandro Jodorowsky (comparisons cannot help but be made) this is one for you, a twisted and gleefully bizarre tail. Itâ€™s a mystery full of unexpected turns that confound expectations and keep one glued to the screen for the full two-hour running time. Sure, I was confused and trying to make sense of something that didnâ€™t want sense to be made of it, yet at no point did I squirm, yawn or think about dinner, everything worked. The music, colour schemes and especially the insane sense of humour that had the audience at my screening laughing out loud and often (youâ€™ve got to love horror festival audiences, few others will openly laugh at explicit violence). So, get ye to a screening! Donâ€™t miss this, itâ€™s the genuine article. Must see movie, my top of the list Indonesian Movie. oh dude, i love you! Joko Anwar is a genius, man. If you give 9 out of 10 for the movie, i'd give 11 out of 10 for the SOUNDTRACK! kudos to MANTRA, SORE, Alfred Ayal, Tika and the Dissidents, and sir Aghi Narottama! Yes, the soundtrack is incredible! Thanks for your comment. Great review, makes me want to watch this movie more. I guess i have to wait for the DVD.